Uzbekistan state mining company Navoi Mining and Metallurgical Combinat (NMMC) is the only company in Uzbekistan engaged in uranium mining and production of finished products for export in the form of triuranium octoxide. According to the World Nuclear Association and IAEA, Uzbekistan is in seventh place in the world in uranium reserves and in fifth place in its production. About 40 deposits with uranium reserves have been explored in the country so far, with 27 in production or planned for development. According to the Information Centre of the State Committee for Geology and Mineral Resources, explored and estimated uranium reserves amount to 185,800 t. Uranium mining is carried out by the eco-friendly method of in situ leaching (ISL) through systems of geotechnical wells constructed on the surface. This technology has increased the resource base by bringing into production low grade sandstone-type deposits, processing of which was previously considered uneconomic. Today NMMC produces uranium at 20 fields. Another 10 are considered to be promising. It should be noted that the uranium mining in Uzbekistan has increased by almost 50% over the last ten years. And the uranium industry is steadily developing its capacity due to increased production at existing plants and the commissioning of new facilities. 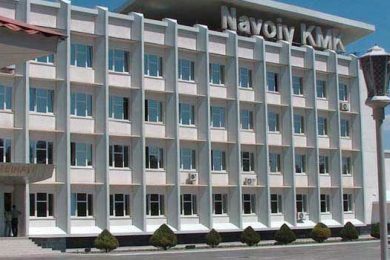 Navoi Mining and Metallurgical Combinat says it conducts technical modernisation aimed at quality improvement of its output as well as cost cutting and expansion of production capacities. The development of NMMC’s uranium production is being advanced with full planning and scheduling needed for all necessary inventory items. Currently, there are seven ISL mines. The uranium containing concentrate obtained in the mines is processed at Hydrometallurgical Plant No. 1, and then a finished product (triuranium octoxide) is transferred for exports. The Government of Uzbekistan is constantly modernising the industry and is leading the search for new uranium deposits. During 2008-2012, Uzbekistan invested $165 million in the expansion and improvement of the uranium industry. In 2013, NMMC spent about $125 million on technological modernisation and completion of six mines. In the next five years, new uranium deposits are going to be put into operation. New mining methods are also being developed that will increase uranium resources by thousands of tonnes. In February 2011 the Scientific and Production Centre (SPC) “Geology of Precious Metals and Uranium” was set up as a new affiliate of NMMC, and conducts prospecting and exploration works on the territory of the country. A uranium production development program has been developed and is being implemented for the period of 2014-2020, according to which the Kendyktyube, Lyavlyakan, Tohumbet, Aksay, Sugrali, Nurbulok, Alendy, Aulbek deposits have been put into operation; the North Kanimekh deposit was brought up to its designed production capacity; and uranium mining technology at the Maylisay deposit was optimised. It is expected that in 2016 uranium production will almost double from 2,400 t/y yo 4,200 t/y. The work on the advanced program development of uranium production is to continue until 2030. In addition to Uzbekistan, only Kazakhstan is producing and exporting uranium in Central Asia, which is the largest producer of uranium in the world. Although Uzbekistan is unlikely to catch up on the uranium extraction volumes of Kazakhstan, the expected two-fold increase in uranium production will allow it to soon overtake Russia – the second largest uranium producer in the CIS.